I have created 100 GB for /. When I opened Nautilus I have found the root folder. So what is difference between / and /root? My username is enigma, and I have a folder named enigma in the /home folder and another folder with the same name in /media. What is the difference between these two folders and when do I have to use the second folder? If you're coming to the Linux world (taking Ubuntu flavour as your choice or other one) from the Microsoft Windows world, then these folder structures might seem very confusing. To answer your question, let me give a very brief introduction to the Linux filesystem. In a Linux filesystem every possible and accessible files, folders are created under the "root" filesystem and in Linux system it's denoted as "/" symbol (unlike Windows, where different Drives are created, named C:, D: etc. and you can create and store your files and folders inside those drives). In Windows, the OS is most of the time installed in C: drive. In Linux, everything comes under / (aka "root" directory). When you install the Ubuntu OS, you'll notice that, several existing folders are already there inside /. Open nautilus and click "File system" (or in some new version "Computer" under Devices) in the left sidebar. This is actually what is inside /. Among those folders there are two named "root" and "home". / is called the root directory, for the whole system; all directories of the system descend from this directory one way or another. /home/enigma is your home folder; ie., where your documents are stored, your Desktop, your Music, your videos, your configuration files, etc. /media/enigma is the folder where removable devices, ex, USB sticks, external hard drives, cd's, etc. are mounted. In other words, if you want to access a removable drive, the place you would go to would be /media/enigma/1TB drive or whatever the name of your drive is. The difference between / and /root is easily to explain, / is the main tree (root) of the whole linux file-system and /root is the admin's user-directory equivalent to yours in /home/<username>. A user's home directory is sometimes referred to as ~ and in the case of root that is /root/. For other users, perhaps users that cannot 'see' the rest of the system--they are chrooted into a directory where what they see is '/' as the base, even though parent directories exist. If you can see 'everything'-- '/' is the topmost level of everything on the file system. I just created a picture for you to make it clear. The Linux system is like a tree. The bottom of the tree is the "/". 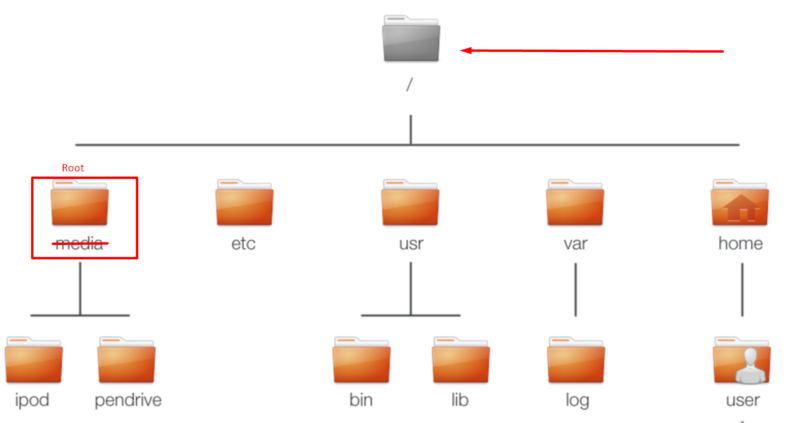 The /root is a folder on the "/" tree. Your home directory is usually /home/$USER, but root's (administrator or superuser, the user that has full privileges) home directory is /root. Since you're not root, you're not able to see the contents inside /root without asking for root access (usually with the sudo command and a shell or file manager, e.g. sudo nautilus). / is the filesystem root. It is like the C:\ drive in Windows. The difference here is that other drives are mounted inside /, usually in /media/$USER/DRIVE (current user only) or in /mnt/DRIVE (for all users). Inside your home folder, you'll find your Desktop, Documents, Downloads, etc. And inside your media folder you have your "mounted" drives (except for /, because it doesn't have to be mounted). So /root is just a home directory inside the real filesystem root. What's the difference between “cd ../” vs. “cd /..”? How can I write user data to the root partition?